MUSEUMS AND GALLERIES. PROFESSIONAL SYMPHONY AND THEATER. PUNTA GORDA IS THE ARTS! From its rich history to the most contemporary artists, Punta Gorda has inspired generations of creativity. Year-round theatrical productions and art exhibits promise an endless bounty of activities. Explore the talents of artists living, working and visiting Punta Gorda in mediums of theater, music and the visual arts. History buffs will want to step into the past as you stroll the streets of Punta Gorda’s Historic District before stopping into the Punta Gorda History Center. 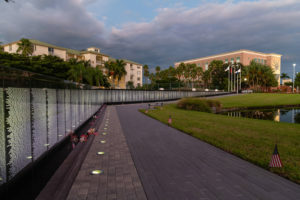 Honor the men and women who served our nation by visiting the Vietnam Memorial Wall of Southwest Florida, a half-scale replica of the memorial in Washington, DC. This permanent installation is a beautiful memorial to the men and women who gave their lives in the Vietnam War. Innovative artists’ galleries are tucked throughout the city. Music festivals, wine and cuisine affairs, and open-air art shows enliven the community throughout the year. Spontaneous jams at the city’s palm-lined, harbor-front park have been known to serenade the sunset. Punta Gorda prides itself on remembering its roots and honoring its history. The city has a thriving historic district with several distinct neighborhoods that each tell their own story. Collectively, these stories weave together to form an important tapestry that is the backdrop for the city today. With so much of Florida covered by cookiecutter, developer-driven gated communities, Punta Gorda proudly wears its deeply-routed history on its sleeve. Just west of downtown, you will find approximately 22 city blocks highlighted by 125 contributing, mostly residential, structures. The period of historic significance for is area is 1884 to 1930 with most contributing structures being frame vernacular and Queen Anne style wood frame structures, dating from the mid 1880’s to the late 1910’s. There are several structures reflecting the 1920’s Florida Land Boom including the Neo-Classical Revival Punta Gorda City Hall. Martin Luther King Jr Blvd). In this area you will find the Blanchard House Museum of African American History and Culture of Charlotte County. 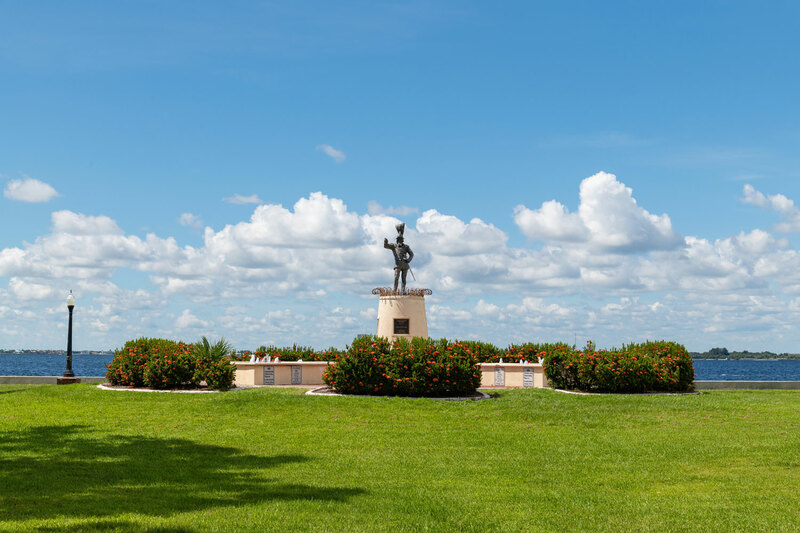 Across from the museum is the Bailey Bothers Park which recognizes seven brothers who served their country with honor in World War II and Korea as well as other members of the African American community which helped shape Punta Gorda’s past and present. Punta Gorda proudly stands among a small number of American cities that were ahead of their time regarding racial integration, tolerance, and acceptance. We invite you to read more about our history by visiting our historic page. Once you have explored the history surrounding our downtown, head into our city center for our last history lesson. The downtown area contains a vibrant mix of historic and new structures. Key historic structures include the National Register listed Punta Gorda Ice House on Tamiami Trail, the Punta Gorda Women’s Club on Sullivan Street, and the Old First National Bank of Punta Gorda building. The city of Punta Gorda is a historic town that lies along beautiful Charlotte Harbor. Streets lined with huge royal palms, beautifully restored period homes with wide verandas, brick lanes, street lamps and benches leave an almost tangible old-Florida atmosphere. Nearly everything is waterfront here from hotels and shopping to parks and fine dining. The small city is one of the most bicycle friendly towns in the U.S. With bike paths connecting nearly all of the city, and a climate that screams to be outdoors, many residents make bicycles their go-to mode of transportation. Punta Gorda was founded in 1884 when on the instructions of entrepreneur Isaac Trabue, surveyor Kelly Harvey began working on the subdivision of Trabue which was filed in Manatee County on February 24, 1885. With streets and blocks arranged along the southern shores of the Peace River at its mouth on Charlotte Harbor. Every waterfront block was designated as a park, a legacy that serves the City to this day with a string of public parks connected by Harborwalk, a 2.5 mile long public promenade. 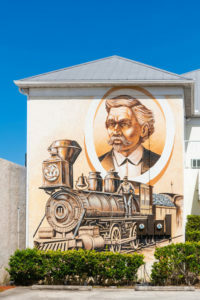 Incorporated on December 7, 1887 after the arrival of the railroad and the construction of the Hotel Punta Gorda, the little city thrived on winter seasonal visitors, agricultural trade, and commercial fishing. With the completion of the first bridge across Charlotte Harbor in June of 1921, the great Florida land boom of the 1920’s reached the fishing village of Punta Gorda. During this period, many of the City’s key structures were built, including City Hall, the Old County Courthouse, and National Register Landmarks including the Punta Gorda Women’s Club, Smith Arcade, Charlotte High School, and the Punta Gorda Atlantic Coast Line Depot.